Jamie Glynn (12), looking amazing with short hair. In the past few years, short hair has become increasingly popular. 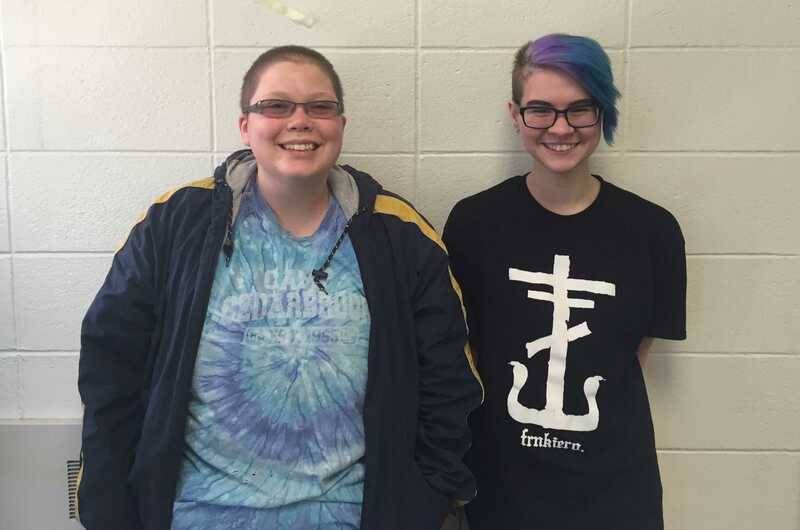 We sat down with several students who once had long hair and asked them about their decision. Many of these students testified that short hair is just easier to manage, like sophomore Ray Wolf (10). “I cut my hair in seventh grade because, to be honest, I wanted to be edgy. But now I keep my hair short because it’s a lot easier to deal with than long hair,” Wolf said. Oliver Holmes, left, who has always had short hair, and Ray Wolf, who cut their hair in seventh grade. Others cut their hair for more significant reasons. Michaela Jackson (10), for instance, wanted a change during her transition from middle school to high school and decided to cut her hair for that reason. On the other hand, Jamie Glynn (12) had considered short hair for a long time, but finally went through with it when she chose to donate the hair to Locks of Love, an organization that creates wigs for children in America and Canada who have lost their hair due to various medical causes. However, many students find that, contrary to popular opinion, there’s no special “meaning” about their hair. “It was just really hot during the summer!” said Molly Farrell (12). Jackson’s experience was similar. Her short hair, she says, simply means less work in the morning! However, other students loved the transition from long hair into short. “It actually makes me feel more feminine. I can express myself more easily through my hair, and I don’t even have to say anything,” Alice Romer (10) said. Glynn agreed. “It’s one of the best decisions I’ve ever made, to cut my hair. It just makes you feel different, makes you stand out more, and brings up your confidence level,” she said. At some schools, however, students aren’t allowed to dye their hair or, if they’re young women, to cut it short, among other restrictions. Most Lindbergh students seem to disagree with these policies. “I am very against stricter dress codes. I think that the dress code we have now is a bit too strict, especially with tank tops and short skirt lengths. And hair dye and piercings don’t infringe on anything,” Wolf said. Emily Berendzen (9) continued upon that line of thought. “I’m of the opinion that people who are attracted to certain parts of the body that aren’t actually inappropriate should be responsible to control that. I don’t think dress codes should really exist unless the shirt has an offensive graphic or text of some sort. I think shoulders are fine,” Berendzen said. In whatever the context, however, short hair looks amazing, and if you want that cut, rock it!